Helium-filled hard drives have a number of mechanical advantages compared to traditional HDDs, but they are also more expensive to manufacture. Western Digital subsidiary HGST introduced the world’s first commercial helium-filled hard drive in 2013, targeting datacenters. 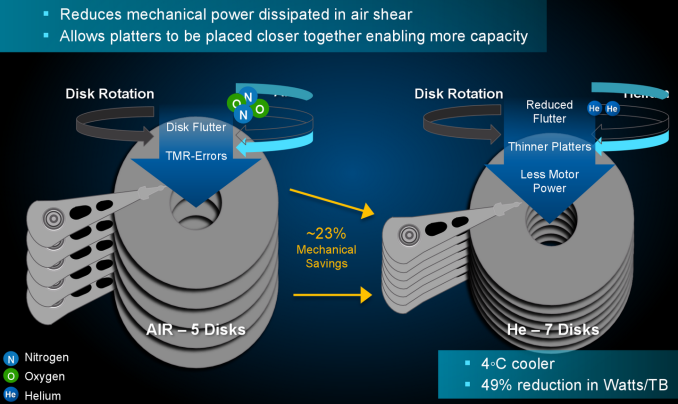 Since then, the company has launched two more generations of its helium drives, including two models with 10 TB capacity. This week Western Digital unveiled the world’s first family of helium-filled HDDs designed for consumer applications, which will be sold under the WD brand. The family of WD’s hermetically-sealed helium-filled hard drives will include WD Red, WD Red Pro and WD Purple 3.5” internal HDDs as well as My Cloud, My Book and My Book Duo external storage systems based on the new drives. Western Digital’s first helium-filled WD HDDs feature 8 TB capacity and HelioSeal technology for hermetic sealing. WD confirmed that the upcoming WD Red, WD Red Pro and WD Purple hard drives may include components and technologies originally designed by HGST, but the WD drives are not re-branded Ultrastar He10-8 HDDs with six platters. While it is logical to expect the new helium-filled WD-branded drives to use the same 1.33 TB PMR platters as the datacenter-class HGST Ultrastar He10-8 HDDs, Western Digital has not confirmed that. WD is not disclosing much int he way of technical details about its new hard drives, but indicates that they are based on different platforms that are tailored for their respective applications. For example, the WD Red 8 TB and the WD Purple 8 TB helium-filled HDDs feature 5400 RPM spindle speed, whereas the WD Red Pro 8 TB will sport 7200 RPM-class spindle speed. Like other contemporary HDDs, the new helium-filled drives from WD will feature 4 KB sectors, but will also support 512 byte sectors using emulation. Just like their predecessors, the new hard drives come with SATA III (6 Gbps) interface. Since the WD Red 8 TB is aimed at personal or small business NAS systems with up to eight bays, it is optimized for mixed workloads. 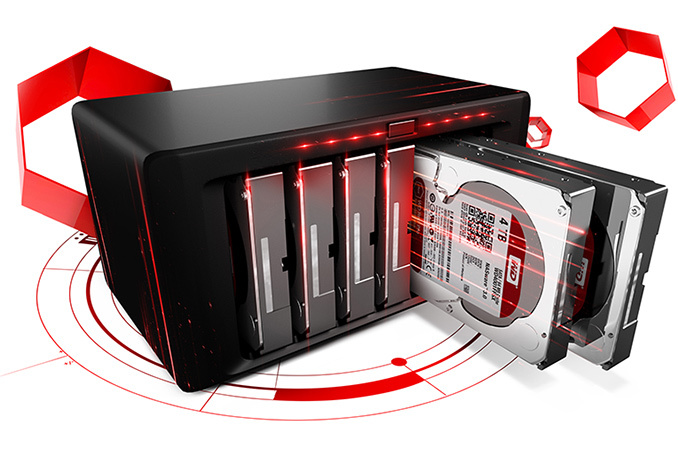 The WD Red Pro 8 TB is engineered for small business and enterprise-class NAS systems with up to 16 bays, which is why the drives feature extra protection against vibrations, larger caches and improved random read performance (thanks to both 7200 RPM spindle speed and firmware tuning). The WD Purple 8 TB drives are designed for surveillance applications that operated 24/7 and required support for ATA streaming technology, writing-related optimizations, as well as protection against vibration in systems with up to eight HDDs. The density of helium is one-seventh that of air, which reduces drag force acting on the spinning disk stack and lowers fluid flow forces affecting the disks and the heads, allowing for platters to be thinner and a larger number to be packed more densely. Meanwhile thanks to helium and increased areal density of platters, the new WD Red, WD Red Pro and WD Purple HDDs will increase sequential read/write performance, lower power consumption and reduce noise levels compared to their predecessors. Unfortunately, precise specifications of the new drives will only be available when the HDDs are commercially released later this year. Initially, Western Digital will only offer My Book (WDBFJK0080HBK) and My Book for Mac (WDBYCC0080HBK) external HDDs with 8 TB capacity for $299.99 in select U.S. stores as well as online. Typically, WD’s My Book external storage systems use hard drives with 5400 RPM spindle speed. Therefore, it looks like Western Digital starts to sell the basic helium-filled consumer-class HDD first, which is a logical decision for a brand new platform. It is noteworthy that while the new external drives are not cheap, they are around $70 more expensive than Seagate’s Archive internal 3.5” drive with 8 TB capacity and SMR platters (which has been on the market for well over a year). It is hard to say whether Western Digital has managed to develop an inexpensive helium-filled HDD platform, but it certainly looks like the company intends to use helium in order to increase capacities of its high-end hard drives and without needing to implement SMR. At present, Western Digital only uses its helium platform for NAS drives, but eventually it may adopt it for its high-performance WD Black HDDs for desktops. The hermetically-sealed helium-filled internal WD HDDs will be available later in H1 of this year, just like My Cloud- and My Book Duo-series storage systems with multiple drives.